Hi everyone, today I'm here for Craftie Café and for today I have a wedding card using the Modern Peonies stamp set from WPlus9 and Peerless Watercolours to do some quick and messy watercolour. To begin my card I first stamped out all of my images from the stamp set onto some watercolour paper with Versafine Onyx Black Ink and then clear heat embossed my images as well. Next up I used my Peerless Watercolours to messily colour in all my flowers and leaves. I then dried them off with a heat tool and cut them out using the coordinating dies. I then decided to also watercolour my background. I pulled out a light grey peerless watercolour and painted over the background of my watercolour panel and then flicked some darker grey on with a paint brush. Once I liked the look I heat set the panel. Next up I added foam and liquid adhesive onto all the backs of my flowers and leaves and adhered them down onto my background. I used my guillotine trimmer to cut off the excess flowers and leaves overlapping the sides of my panel. 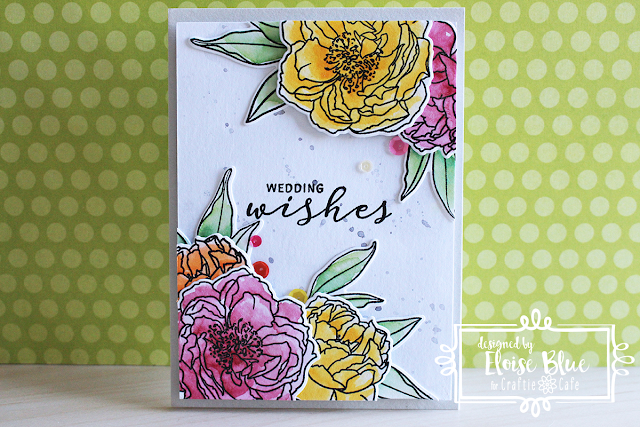 I then pulled out my stamp master tool and stamped the sentiment ‘Wedding Wishes’ from the same set with black ink in the centre of the panel. To finish up the card I added sequins in matching colours from Pretty Pink Posh and adhered my panel to a white card base with fun foam. The video is linked down below. That finished up my card for today, I hope you enjoyed and got inspired. 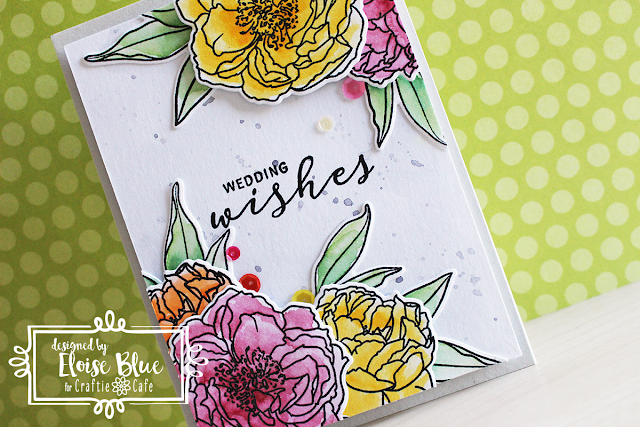 This is such a gorgeous stamp set and it’s so great for many occasions. Thanks so much for stopping by and I’ll catch you all next time!